Eamonn Darcy shared fifth place as England’s Gordon J. Brand closed with a two under par 70 to win his second European Seniors Tour title in the space of seven days at the Travis Perkins plc Senior Masters at Woburn Golf Club. The previous weekend Brand needed six extra holes to see off the challenge of Gordon Brand Jnr at the De Vere PGA Seniors Championship at Slaley Hall but this time he birdied the first to move in front and then recorded further birdies on the fourth, ninth, 11th and 18th to finish two shots in front of Spain’s Juan Quiros and three ahead of defending champion Carl Mason on nine under par 207. The win was worth €46,986 (£37,500) and took his earnings for the two tournaments to €110,446 (£97,500). The back-to-back victories also mean that Brand travels to this week’s Casa Serena Open in the Czech Republic knowing that another good performance could see him put pressure on both Ian Woosnam and Bernhard Langer at the top of the European Seniors Tour Order of Merit. Mason started the day three shots behind overnight leader Quiros but when the Spaniard hit his opening drive out-of-bounds to run up an ugly double bogey seven it look as if he might be Brand’s nearest challenger. However the Spaniard did not let that early upset affect him and two closing birdies gave him a one over par 73 and pipped Mason for second place. Further down the leaderboard first round leader Angel Franco closed with a 73 to claim fourth place just ahead of Ireland’s Eamonn Darcy and Australia’s Stewart Ginn while Italian Ryder Cup star Costantino Rocca overcame a ruinous nine on the 537-yard par-5 14th to post a 74 and finish tied in seventh place alongside English trio Peter Mitchell, Nick Job and Jim Rhodes on level par 216. Meanwhile Order of Merit leader Woosnam dropped three shots over his last five holes but still returned a 73 that saw him climb into a share of eleventh place with Horacio Carbonetti and Seiji Ebihara on one over par 217. Mark James closed with a two over par 74 on finish in a tie for 14th place on two over par 218 while Scotland’s Sam Torrance was one shot further back after a final round 71. A stupendous round of 68 – the lowest of the week – on the third day of the De Vere Collection PGA Seniors Championship put England’s Gordon J Brand in sight of his fourth Seniors Tour title. Mark James defeated former Ryder Cup teammate Eamonn Darcy in a play-off to win the Son Gual Mallorca Senior Open and clinch his second European Senior Tour victory after a thrilling final day in Palma. Evergreen Smyth wins again: "My next goal is to win in my 60s"
Des Smyth has won in every decade since he turned professional in 1974. Picture © Getty ImagesDes Smyth won his second Travis Perkins plc Senior Masters and notched his seventh wins as a senior when he fired a superb four under par 68 in the final round at Woburn. 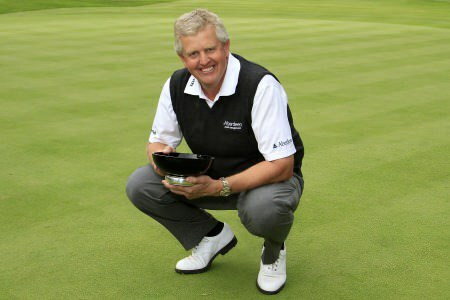 Colin Montgomerie claimed his maiden win as a Senior at Woburn.Picture ©Getty ImagesPhilip Walton let a decent cheque slip away for the second week running when he closed with a 77 in the Travis Perkins plc Senior Masters at Woburn.